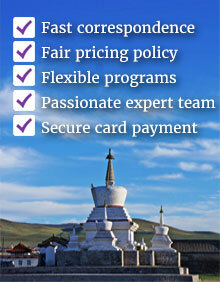 How to Book a tour with Premium Travel Mongolia? To make a booking you can contact us in several ways: directly via our website www.premiumtravel.mn or www.mongoliatravelmarket.com (‘Website’), or by email to info@mongoliatravelmarket.com or to the direct email of your corresponding Premium Travel specialist. The person making the booking (the ‘lead name’) must be 18 years old or over and possess the legal capacity and authority to make the booking and accepts these booking conditions on behalf of everyone in their party. Whether you book alone or as a group, we will only deal with the lead name in all subsequent correspondence, including changes, amendments and cancellations. The lead name is responsible for ensuring the accuracy of the personal details or any other information supplied in respect of yourself and any other person travelling on the booking and for passing on any information regarding the booking or any changes made in relation thereto, to all persons travelling on such booking, including but not limited to information on schedule changes or copies of booking confirmations. For all holidays, excluding Naadam Festival holidays, you will need to pay a deposit to us at the time of booking of at least 20% of your selected travel arrangements. For Naadam Festival holidays the required deposit is 30% of your selected travel arrangements. We will then invoice you for the remainder of the cost due before you travel, which you must pay not later than 31 days (60 days for Naadam Festival holidays) before departure. In certain cases we may request full payment more than 60 days before departure where, for example, domestic airlines require full payment on booking. If you book less than 31 days before departure (60 days for Naadam Festival holidays), full payment must be made on booking. When we accept your booking, we will issue a Confirmation Invoice. A contract will automatically exist between us from the date we issue the Confirmation Invoice. When you receive the Confirmation Invoice please check the details carefully and inform us immediately if anything is incorrect. Names on travel documents must exactly match those in your passports. Unless we are responsible for the mistake, we will not accept liability if an airline or other supplier refuses boarding because the name(s) shown in your passport differ from those on your ticket. Travel documents will be emailed to you approximately 2-3 weeks before the departure of your tour. If requested in the trip information documents you must reconfirm the reservations, timings and check-in details of your flight with the airline concerned at least 72 hours before departure. This applies to your outward flight and to your return flight. If you miss a flight or suffer any disruption as a result of not following our instructions as to reconfirmation we will have no liability to you. Your personal safety is of top importance to us and therefore, it is vital that you advise us at the time of booking of any condition, medical or vegetarian etc. It is a condition of your booking that you and all members of your party provide certain information that may be sent to governmental authorities and border control and security agencies for the purpose of visa permit or security. This is known as Advance Passenger Information, sometimes known as APIS. The information you must provide will include, but not be limited to, full name – as shown in your passport or travel document, gender, date of birth, travel document type, number, country of issue and expiry date, and your postal address. You must provide this information by the time of booking. For more booking info, please check our tour booking TERMS & CONDITIONS.